Sporting Services was the brainchild of Sue and Buck Smithson of Southern Pines, NC. Late 2016, they decided it was time to move onto the next chapter of their life, and pass the torch on to Patricia Hildreth and Cassidy Sitton of Zebulon, NC. 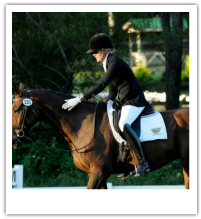 Patti and Cassidy bring a combined experience of competing, horse show management, and varied professional backgrounds to Sporting Services. Patti works in Knightdale, NC as a Professional Engineer. She has run NCDCTA schooling shows out of her Whinstone Farm in Zebulon, NC, has served as the Competition Chairperson for the NCDCTA from 2015 -2017 and is a PM Delegate for USDF. Whinstone Farm also is a small breeding operation and breeds warmblood sport horse prospects. Patti is currently competing her homebred Oldenburg gelding, Whinstone Ferro at Third Level and she achieved her Bronze Medal in 2015. Cassidy runs her own C-Horse Equestrian around the triangle area. She has competed to the Intermediate level in eventing and Fourth Level in dressage, achieving her bronze medal in 2014. Before becoming an equine professional, she had a career in marketing and public relations and currently sits on the NCDCTA Board as the Communication Chairperson. She also has branched beyond the equestrian realm to start a design company, Couture Cobbler.